The Greek government has defaulted on its debts to private sector bond holders to the tune of €173bn. That’s the biggest sovereign debt default in history. This was achieved by a negotiated ‘voluntary’ deal with Europe’s banks, insurance companies, pension funds and hedge funds. The Greek banks have taken the biggest hit, along with the Greek state pension funds (Greek state pensions are already being slashed). Private sector involvement (PSI) in the deal was 95% of all bondholders, after the Greek government invoked so-called collective action clauses (CACs). CACs meant that those who refused the accept the 50% haircut in the value of their bonds would be forced to because enough bond holders had agreed to the terms ‘voluntarily’. The remaining bond holders still refusing the deal have until 23 March to change their minds and may still face default anyway. Of course, the bond holders are not taking a hit to the value of their holdings without some sweeteners. Under the deal, they receive new Greek government bonds with 30-year lives, paying about 3-4% a year in interest and guaranteed by the Eurozone financing operation, the EFSF. And they also get some cash upfront for turning in their old bonds. In addition, those bondholders that took out insurance against default (credit default swaps) may well get compensated for any losses by the sellers of such insurance,often the same banks and insurance companies that hold the Greek bonds in the first place! – such is the madness of finance capital. With the default deal more or less settled, the Euro leaders will now agree to finance the Greek government’s remaining debt for the next three years at their summit meeting next week. The Euro leaders in return are expecting the Greek government to impose on its people the most draconian reduction in living standards, public services, jobs and spending seen since the Great Depression for a European country (with the possible exception of tiny Latvia). The Greek capitalist economy has sunk. Real GDP fell in the last quarter of 2011 by 18% an annualised basis. The cumulative fall from peak to trough is likely to be anywhere between 25-30%. The consequences for the Greek people are difficult to comprehend (see previous posts). The cruel irony is that the Troika’s demands to cut real wages, destroy trade union rights and labour conditions, while massacring the public sector through privatisations and cuts, will not do the trick and make it possible for Greece to become competitive and grow sufficiently to meet the fiscal targets set by the Euro leaders. With Greece in such a deep recession, it cannot manage it. The Troika target is for Greece to get its public debt burden down from 166% of GDP before the debt default to 120% of GDP by the end of the decade. To achieve that, the Euro leaders and the IMF are providing around €130bn in new money plus €34bn left over from the previous Greek package to fund the interest to be paid on the new Greek government bonds, repayments to the IMF, money to recapitalise the Greek banks and money for the cash on the PSI deal. But, of the total of €164bn funding, only €23bn is going towards financing the Greek government’s planned sharply reduced budget deficit. In other words, all this Eurowide/IMF funding is going to pay back the banks, insurance companies and the ECB (another circle of finance!). Hardly any is going to help the Greek economy and its people get out of the straitjacket imposed on them. The reality is that just the slightest slip from the budget targets or from the supposed growth projections and the fiscal plan falls apart. Indeed, the Greek government’s debt ratio could easily be even higher than now by 2020, if growth does not materialise or if privatisation proceeds are not achieved. From here, about 75% of all the Greek government debt will be held by the Eurozone financial bodies, the IMF and the ECB, ie the Troika. 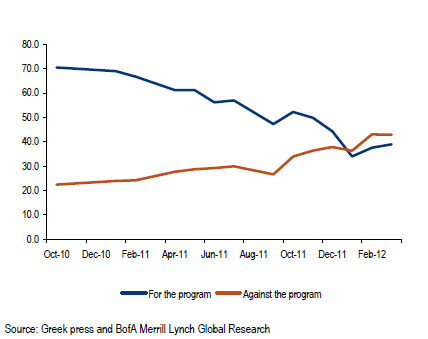 The remaining private sector debt is also guaranteed by the Troika. So the question of what will happen when the Greeks fail to meet the targets set by the Troika over the next months will become a political question. Will the Euro leaders and the IMF be prepared to give the Greek government more money or more time to pay, as they plan to do with Portugal and Ireland, if necessary? Or will they cut the Greeks loose and let them fend for themselves, as it were, probably outside the Euro area? The Euro leaders want to keep the Greeks inside because the precedent of a Greek exit could be really damaging to the whole euro project. But they want the Greeks to take their fiscal hemlock (a la Socrates) or else. The problem is that they cannot have both. That question may come to a head even more quickly than the Troika thinks, if the Greeks decide in their upcoming election (it looks like 6 or 13 May) to vote in a government that is opposed to the austerity package. The latest polls suggest that the those parties opposed will get a higher overall vote than those supporting it – although the anti-austerity parties are all hopelessly divided and may not work together. Also there are signs that the pressure on left leaders in various parties in Europe is building up from below, forcing them to make statements opposing the Troika’s austerity programme. The socialist candidate for the French presidency in elections in April-May, Francois Hollande, says he wants to renegotiate the terms of the fiscal compact that the Euro leaders have signed up to. And Hollande is likely to win in May. This weekend, Slovakia goes to the polls and looks set to elect an anti-austerity government in a complete reversal of its previous stance. Sure, this is just talk from the left leaders. After all Slovakia’s left leader is still committed to the last budget measures, although he now wants ‘progressive taxation’. Nevertheless, it may not be so easy for the conservative Euro leaders to stick to their fiscal austerity policy, which is designed to appeal to the financial markets and right-wing nationalism in various countries, in the face of growing opposition. The fightback may come to nothing if the Greeks provide enough votes for the pro-austerity parties to form a government, or if Hollande loses or does nothing afterwards. If that happens, then the Greek economy will stay deep in depression for a decade and a whole generation of young people in Greece (53% youth unemployed), Spain, Italy and Portugal (among others) will remain without jobs and hope, and pensioners will be reduced to paupers. This entry was posted on March 9, 2012 at 3:07 pm and is filed under capitalism, economics. You can follow any responses to this entry through the RSS 2.0 feed. You can leave a response, or trackback from your own site. I think you’re right ! POLITICAL Economy with a vengeance! I’d like to see your take on chapters 33-35 of Capital III – what Engels called “the Confusion” due to the chaotic state of the manuscript. Monetary policy and in particular the incoherent theories and nostrums held and proposed by the financial elite of the day in relation to the great financial and economic crises of 1848 and 1858. Strikes me that exactly the same notions and nostrums are being regurgitated today. Another interesting economics article from Michael Roberts. Very interesting that no one is actually calling a default a default. One gets the feeling that the Greek people’s misery is far from over too……. Hollande is talking about a 75 per cent tax on all income over a million Euros. You point out correctly that EU conservative core is in some unrest from the possibility that the Greek parties already committed to the austerity plan will not manage to seize a majority of the public vote. In my personal view the collapse of Greek capitalism has already turned to a political crisis which will escalate in the near future irrespective of what happens in the upcomming election. The question is what will the left do in this environment. ? Here commes my disagreement with you, if the Greek and European left have as their major objective the dream that the EU, which was founded on the neoliberal policies included in the Maastriht treaty will turn to a labor loving organization committed to social welfare they will channel social unrest to the wrong direction, to an unrealistic political target. If on the other hand the Greek and Eurpean left commit to national plans which instead of channeling trillions to jombie banks channel funds in direct state investment targetting to job creation then a new European left majority may prevail..